HOW DOES MEDICAL FLOSSING WORK? The origin of the Medical Flossing can be found in VooDooFlossing. Dr. Kelly Starrett, an American trainer, physical therapist and author, describes some nonspecific joint systems using VoodooFlossing for limb joints to improve mobility [Starrett K., 2014, 2015]. The idea behind Medical Flossing is to use this very effective training method, known to us from occlusion training and VooDooFlossing, for the practical, therapeutic treatment of various indications. Here are acute and subacute injuries of the musculoskeletal system, but also longer-term problems in focus. Medical Flossing can be used by young athletes with sports injuries as well as geriatric patients with, for example, a full knee prosthesis. The material is a 1 to 2 mm thick stretch latex tape. Depending on the indication and the therapy goal, more or less pressure is applied circularly around the area to be treated. The resulting externally induced pressure and the cohesive force of the tape against the skin surface and the subcutaneous tissue cause various effects that reduce pain and improve the range of motion. There are three forms of application: muscle application, fascial application and joint application. The basis for the operating theory of Medical Flossing is the Tensegrity model, a model created from geometry. It first of all describes an architectural structure in which a coherent network can be influenced by every structure in it and constantly has the urge to return to its original starting position. There are stable and elastic elements in this network [Myers T., 2001]. Abstracted on the human body, this means the following: Macrophysiologically there are stable elements (bones, organs) and elastic elements (myofascial system, cartilage, etc.) that are interconnected throughout the body, without stable elements touching each other directly. As a result, the body is very flexible, but at the same time very stable and can withstand high loads [cp. Lakes R., 1993, Ball P. 1999]. Pathophysiologically, we assume that often restrictions or changes in the stress ratio of the elastic elements are the cause of problems, pain and limitations [cf. Williams P., 1995, Varela F. 1987]. With the Medical Flossing the myofascial structures can be restored to their physiological tone. Microphysiologically, we also have an elastic system (integrins and extracellular matrix). It is responsible for mechano-regulation, which extends the model of chemoregulation, and thus is able to alter cell structure and activity and thus affect disease progression or mechanical problems [Ingber D., 1998, 2003, 2006]. In other words, we can directly influence the microphysiological processes by working externally with compressive and tensile loads. Like the tensegrity model, the human body follows the urge to return to the "physiological starting position". With the effects of Medical Flossing we set various stimuli that set this car repair mechanism in motion. Both at the microphysiological and macrophysiological level, the desired effects can be achieved by means of various application adaptations in conjunction with known treatment techniques. These will be further described. The Medical Flossing is based on three important basic effects: the sponge effect, the Kinetic Resolve and the subcutaneous irritation, which are roughly described below. These three effects affect the myofascial system, the lymphatic system and the autonomic system. The sponge effect describes the effect caused by the high compression on the tissue. The venous return flow is almost blocked and the arterial influx is inhibited many times, similar to the occlusion training. The extracellular tissue is "squeezed" so that lymphatic loads can be carried to the lymphatic system and transported away. On the muscles, this sponge effect can also be transferred. Waste products are transported out of the muscle cells and the endomysium and after removal of the application creates a hyperemia, which provides both the muscle, as well as the extracellular tissue and the fasciae with fluid and energy. In the joint itself, the application promotes the resorption of the synovium and improves, as mentioned above. the trophic also of the intra-articular tissue. This effect benefits the physician or therapist primarily with acute swelling injuries and increases the effect of joint drainage, for example. Kinetic Resolve describes the mechanical effect mainly on the myofascial system. This involves solving inter- and intra-arterial cross-links, which may be a factor in restricting movement or reducing neurovascular flow. This mechanical effect is created only by movement, passive or active. In doing so, the fascia layers, the subcutaneous tissue among each other, but also against adjacent muscles, bones or joints are displaced, which leads to a painful breakthrough of these hydrogen bonds (cross-links). The mobility is improved under the tissue layers and ongoing the adjacent joints. In the typodos fascia distortion model, cylinder distortions are defined that describe an overlap of the circular fibers of the superficial spiral fascia. Medical Flossing offers with the effect of Kinetic Resolve an excellent treatment technique for this indication. Subcutaneous irritation is one of the most important pain reduction effects. The theoretical background for this is the gate control theory. As already known from many other techniques, nociceptive inhibition can be achieved by the stimulation of mechanoreceptors, pressure and movement impulses in the segmental dorsal horn of the spinal cord. Of course, we use this effect in medical flossing as well! These three effects lay the foundation for the therapeutic intervention and at the same time the possibilities of adaptation of the application depending on the therapeutic goal. The therapist adjusts the three parameters pressure (sponge effect), motion (kinetic resistance) and irritation (subcutaneous irritation) individually to the patient and the structures currently being treated, thereby changing the weighting of the individual effects. A distinction is made between three forms of application: muscle application, fascial application and joint application, for which a different system is required by the different addressees. There is no existing evidence for the therapy with the Flossband. 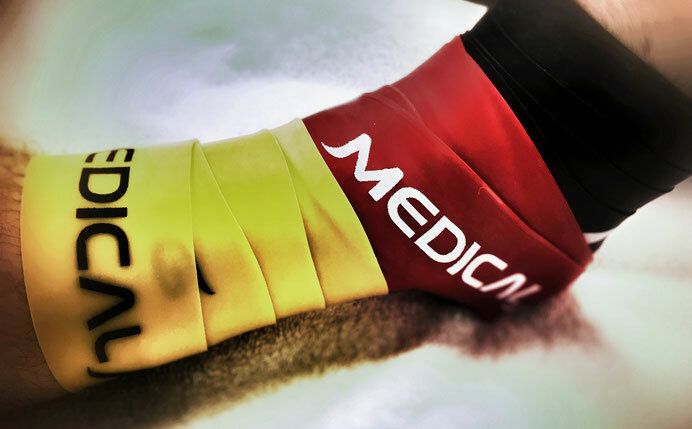 An ongoing pilot study addresses the effectiveness of medical flucing on acute or subacute ankle and knee problems in professional footballers in terms of pain relief and impact on range of motion. The results remain to be seen. In practical application, very positive results have already been achieved in a wide variety of indications. Professional athletes with acute myofascial imbalances, geriatric patients with endoprostheses, arthritic joints, epicondylitis, sports injuries such as ligament (partial) rupture, etc., to chronic lumbalgias are diagnoses for which treatment with medical flossing may be indicated. It seems to improve the handling and the economics of the therapist and the outcome of the patient. This should be further investigated! Medical Flossing is very similar to the principles of occlusal training. However, the occlusion training has been influenced by the objective of hypertrophy [cf. Fry A., 2004] has a limited background and is limited to the training sciences. Medical Flossing focuses on the physiological effects of occlusion training on the biochemical milieu of the muscles [Lakrin et. al, 2012], but also influences further structures through the described application forms. Medical Flossing describes a tool that is used in physiotherapy, manual therapy, osteopathy, orthopedics, sports medicine, etc. and serves as an effective, economic supplement, not as a replacement for the individual areas. The method can be very painful with most types of application and consequences such as hematomas, wheals, etc., as well as from other therapy techniques (cupping, Faszientechnik) known. Therefore, it is recommended to request a declaration of consent from the patient. This is not explicitly necessary, but brings a professional appearance with it. Contraindications must be carefully considered. Absolute contraindications include malignancies, recent thrombosis or thromboembolism, acute septic inflammation and congestive heart failure (NYHA III or IV). Relative contraindications include, for example, chronic inflammation, fever, expired thrombosis, hypotension, thyroid dysfunction, pregnancy or bronchial asthma. By application on the skin open wounds, burns or other skin changes are also relative contraindications. Known from other therapies such as manual lymphatic drainage, the treatment with the floss tape may be adapted accordingly depending on the secondary diagnosis [cf. Schreiner O., 2014]. When my left shoulder began to hurt in the spring of 2014, I could not have guessed what the consequences would be. At first, I saw the problems in response to my regular training in the gym. In the following weeks, both the pain in the shoulder and the mobility decreased rapidly, so that in April only a very small range of motion was available to me. Meanwhile I had several "main pain areas". The outer scapular rim, the roof of the shoulder, a large area of the lateral upper arm, and even the humerus itself seemed to be affected. As a rule, I am a good patient, i. In the usual neck or back pain of a late forties, my symptoms relieve already in the first days after physiotherapeutic treatments. For more than three or four weeks I had never really had any problems at the time. In this case, that was completely different! My shoulder was almost stiff for months and extremely painful. All activities in daily life, the work and the nights were unbearable - I was annoyed, because all imaginable therapy methods did not even fruit! Manual Therapy, Osteopathy, Acupuncture Massage, FDM, Acupuncture (just to name a few) - all that I've come across as extremely effective and helpful in treating patients over the past 25 years has been completely unsuccessful on my own shoulder. It was not the case that I ran from doctor to doctor - and therapist to therapist. I gave each treatment the chance to work, without even the slightest relief. In the meantime MRI scans came out only what can be found in an average man my age: subtle signs of wear here and slight signs of wear there - no indication for surgery! My blood counts were impeccable and no sign of rheumatic signs. In the summer, I then injected myself with cortisone - with the same effect, namely none! So the summer moved in and the most painful autumn of my life began - until one evening I sat down at the computer and typed in the search engine "SCHULTERSCHMERZ" ... It must be quite violent, if a physiotherapist with 25 years of doing something like this. But that's the way it was. Then I ended up with Kelly Starrett, a colleague in the US, who wrapped his trainees' long elastic bands around joints and muscles to improve their mobility and recovery. After initial skepticism, I explored everything about voodoo flossing, which was to be found - but that was not very much! No literature, only videos on Youtube. Some time later, I held the rubber band in my hands and started - I was alone at home - to wrap my shoulder with one hand, rather ABZUSCHEN. Nearly impossible if the affected shoulder massively hurts and allows no movement. After a few minutes it was done. The left arm was pale, the feeling wich and the previous pain was joined by about 10,000 pins in the area of the wrapped parts of the shoulder. And now MOVE! Arm up, down, turn, back and forth. I did not know what hurt more - the shoulder as such or the rubber band. In any case, both of these were beyond all my previous experiences of pain. After about 4-5 minutes of intense shoulder mobilization, the moment of tension came. What would happen? I quickly wound the tape and experienced an experience of absolute bliss! From one to the other second, full life poured into my arm through my shoulder! I tried to lift it and came ... almost to the ceiling. I rotated outward and inward, could bring my hand behind my back after months - and with about 90% less pain than before! In short - it was incredible! Immediately thought came after the duration of this success - and of course a "How is this possible?" The next morning, I realized that there had been no regression overnight. The mobility remained and the reduction of the pain as well. From now on, I let myself flow daily from my co-workers, until after about 3-4 weeks my maximum range of movement completely and pain-free reached bar.